An important question, no doubt, not only because the answer they expected to hear would be many millions (or tens of millions) of dollars. But also because business valuation is a highly subjective topic, a concoction of art and science. You will hear many responses to the question of what a business is worth. One oft-quoted answer is the technically accurate, yet singularly unhelpful adage “a business is worth exactly what a knowledgeable, willing, and unpressured buyer would pay to a knowledgeable, willing, and unpressured seller in the open market.” It is tough to put your finger on what exact figure that formula yields. And so, we move beyond the theoretical into the land of the more practical. Below are the top quantitative and qualitative valuation techniques used today, but (spoiler alert!) none of them is the correct answer. Liquidation value is certainly not what a business owner wants to hear in response to a question on valuation, but every business has one. Simply put, if you closed down tomorrow, how much money could you squeeze out of the business? You’d auction off your fixed assets, hold a fire sale on inventory, give discounts to immediately collect as many accounts receivable as possible, and then pay off your vendors, employees, and other business obligations. Not a fun situation to contemplate. For a well-performing business, this would be the lowest valuation possible, only to be considered as a last resort. For a distressed business that is losing money, this may be as good as it gets. Book value, or shareholders’ equity, can be found on any company’s balance sheet and is another potential valuation indicator. This will yield a higher result than liquidation value, as assets are not discounted, but it is still an asset-based valuation technique, which are typically more conservative than the earnings-based approaches discussed next. And if your fixed assets are more valuable than their depreciated value (as they most often are), then book value will be even less attractive. Book value is rarely used for well-performing businesses, as the earnings that those businesses generate should support a higher valuation than the book value of the underlying assets. Comparison to Publicly Traded Companies – this model analyzes how the public markets value the stocks of a group of similar public companies and applies those metrics to the target. Look out for user-applied variables, like control premiums and discounts for size and liquidity; these are fundamentally sound principles but can also have a significant impact on the outcome. Comparison to Precedent M&A Transactions – much like “comps” in the real estate world, this model determines valuation based on what similar companies have sold for historically. Accuracy here depends on the recency of the samples (who cares what a similar company traded for 10 years ago) and the degree of similarity to the subject business. Size discounts are also liberally applied to great effect in this one. Discounted Cash-Flow Analysis (DCF) Model – the most academic of the Big Four and touted as the primary valuation tool of strategic buyers, the DCF model takes a target’s future cash flow streams (along with a terminal value) and discounts them back to the present using their weighted average cost of capital. This model is highly dependent on a handful of assumptions, like the projected cash flows, terminal value, and discount rate, and has no meaningful tie to real-world market valuations. Leveraged Buy-Out (LBO) Model – favorited (and invented) by the private equity community, this model computes the value of a business based on how much acquisition debt the business can support plus the amount of equity that a PE firm can commit to the deal and still generate the returns they require. If the assumptions accurately reflect the current debt and equity markets, this one can provide a relatively accurate view on how most private equity groups might value a business. Investment bankers then take the output from each of these four models and blend them with different weightings to yield an overall valuation range. If the buyer is likely to be a publicly traded company, they also might throw in a fifth model, the Accretion/Dilution model that looks at how the acquisition (at a given valuation) impacts the acquirer’s Earnings Per Share (EPS). Between the assumptions inherent in each model and then the various ways they might be blended together, the final valuation range is definitely more art than science. Size – all other factors being equal, bigger businesses are seen as more diverse, and thus safer, and thus command higher valuation multiples. Industry – the size and perceived health of the target’s industry is also an important factor. Even rock stars in out-of-favor industries will see their valuations lower than they otherwise would be when their industry outlook is more favorable. Growth – businesses that have a track record of higher growth are more valuable, as long as that growth is believed to be sustainable into the future. Management – companies don’t run themselves, and so those with exceptional executives at the helm receive higher valuations than those with lackluster management teams. But here’s the dirty little secret that no one is talking about – it ultimately isn’t about rational valuation techniques at all. Sure, most buyers begin by running some of the aforementioned valuation models. But when it comes to how much extra the most aggressive buyer is willing to pay for your business, only two things really matter, competition and personal intangibles, and they work hand-in-hand. Setting the hook in a buyer is easier said than done, but once accomplished, you can push buyers to bid against each other to attain valuations unsubstantiated by any model. There’s no simple answer to the question of how much a business is worth. Models mixed with your advisor’s experience are used to approximate what a “reasonably aggressive” buyer would pay for your business in the current market, and this is a valuable data point when deciding whether to sell your business. But there’s no predicting what specific factors will ultimately drive one or more buyers to be irrationally aggressive. The key is to present the acquisition opportunity in the best light and create as much competition as possible. That, in a nutshell, is what a good investment banker will do for you. 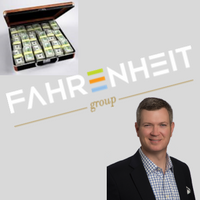 Jonathan Brabrand is a Managing Director at The Fahrenheit Group and brings a unique skill set to the firm based on his 20-year career in middle market investment banking. Having represented dozens of companies in successful sale processes during his tenure at premier firms, he now provides independent pre-transaction advisory services to entrepreneurs, business owners, and Boards of Directors to help them evaluate and prepare for future liquidity events, including M&A transactions, leveraged recapitalizations, or capital raises.